Resolution is just as important as screen size, though, and thus the Galaxy S9 vs iPhone X vs Galaxy S8 comparison is informative here. The Apple smartphone trails in behind both Samsung releases, despite the fact that the manufacturer has seriously upgraded the display included in the iPhone X from previous Apple releases. 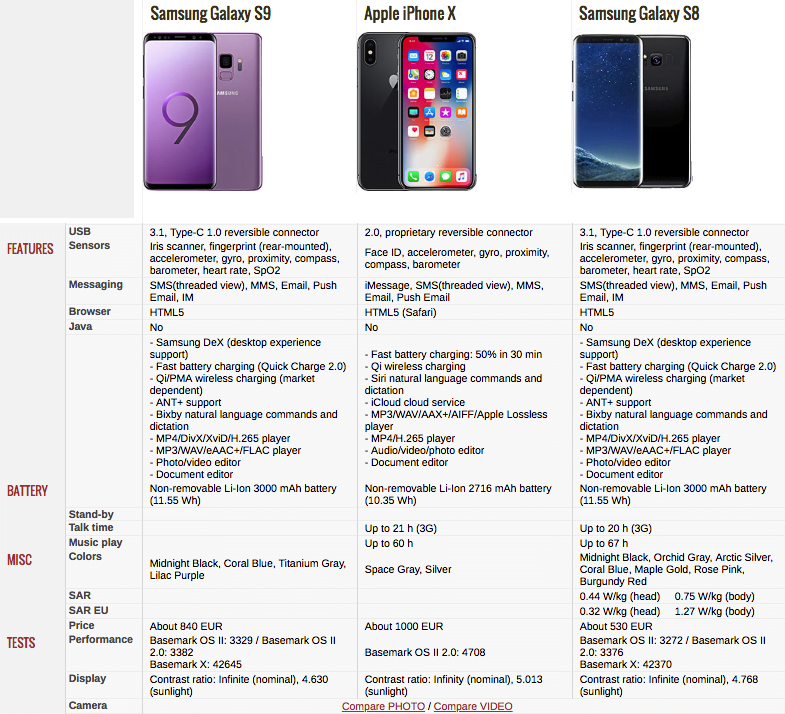 Processing power obviously impacts massively on the performance of any mobile device, so this is another area where the Galaxy S9 vs iPhone X vs Galaxy S8 comparison is particularly informative. It should be noted that the proprietary hardware and software technology that Apple always includes in its smartphones offers a real advantage to the iPhone X. While Apple has previously held an advantage in this department, the recent release of the Galaxy S9 has negated this historical trend. While both the iPhone X and Galaxy S9 offer 256GB versions, Samsung has also included a 128GB model of the S9 which is not present in the iPhone X range. 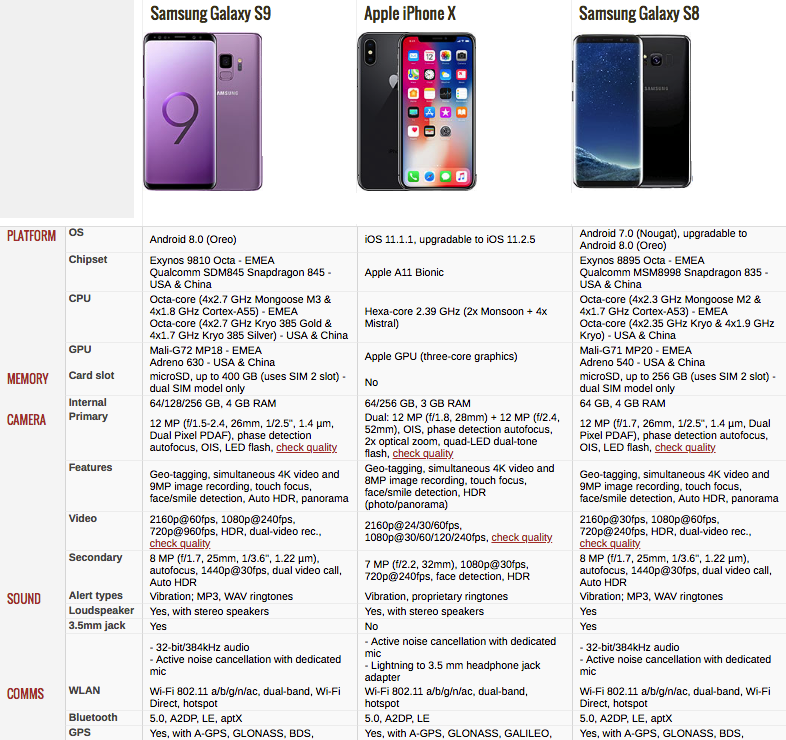 Mobile devices are often marketed as secondary cameras nowadays, meaning that this is a critical aspect of the Galaxy S9 vs iPhone X vs Galaxy S8 comparison. Firstly, let’s look at the specifications of the three devices. Inclusion of a dual-camera in the Galaxy S9 is particularly welcome, and the world-beating aperture that Samsung has boasted ahead of the release of the smartphone certainly makes a tangible difference. It can be stated that the Galaxy S9 is the best smartphone camera on the market, producing superior results in both photographs and videos. Furthermore, the much touted super slow-motion mode is particularly effective, and is an additional string in the bow of the Galaxy S9. 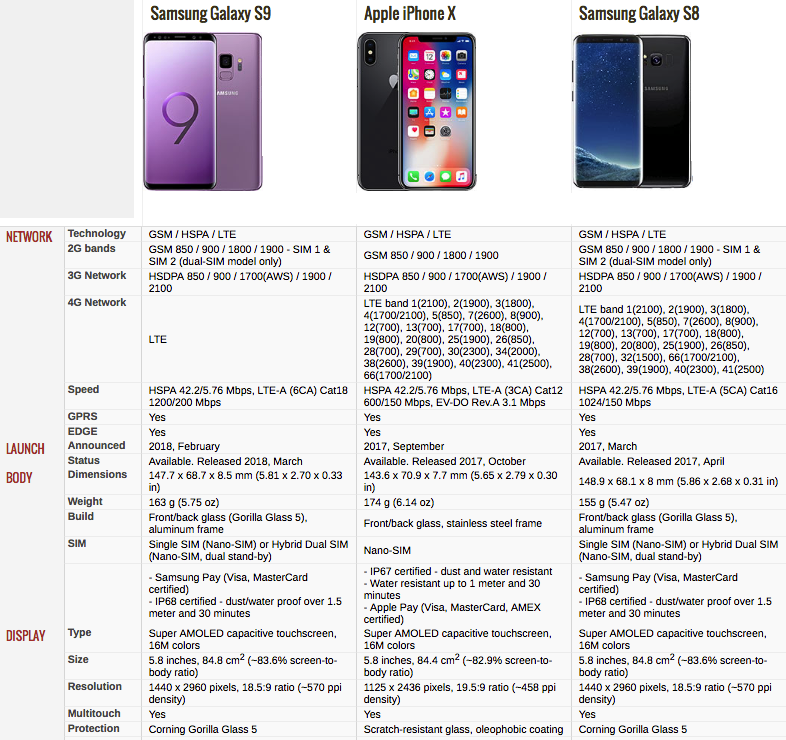 Pricing is also obviously key in the Galaxy S9 vs iPhone X vs Galaxy S8 war, and it is interesting to compare the devices in this department. The Galaxy S8 is now available at a very affordable price tag, with the handset purchasable for around $599 on Amazon.com. With the Galaxy S9 retailing at $720, it is still significantly more affordable than the iPhone X, which was introduced at a price tag $999. Nonetheless, it would be fit to say that the Galaxy S8 represents the value for money option here. When making the Galaxy S9 vs iPhone X vs Galaxy S8 comparison, it must be said that the Galaxy S8 fares rather well against its more recent competition. Samsung hasn’t bumped up the specs of the Galaxy S9 in every department, which means that the Galaxy S8 compares favorably with its successor. The Galaxy S9 does deliver the best smartphone camera to be released as of yet, which will be a major selling point of the unit. Benchmarking suggests that the iPhone X is the most powerful of these three devices, despite an apparent deficit in specifications, yet it is clear that the Galaxy S9 will be a major competitor.